Personalization: Coming across authentic and human is important when building relationships with your customers. Southwest Airlines is a very large organization that deals with thousands of customers daily. 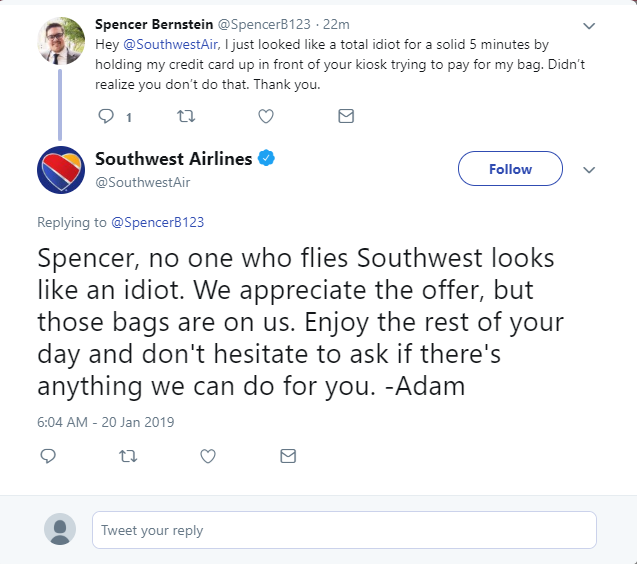 But if you check out their Twitter account, their customer service is personal and adds that human touch element most customers look for when trying to connect with a brand. 5. Subscriptions: Is there a way you can use subscriptions to bolster customer loyalty? For example, think about offering a subscription service that includes free shipping, faster delivery, priority booking, etc. You don’t have to charge a fee for a subscription model to gain customer loyalty. If you provide these benefits in the form of exclusiveness, it’s another way to leverage this approach and enhance your customer experience. 6. Education: One of the most valuable things you can offer your customers is new learning or advice. Your customer’s experience doesn’t end after they make a purchase. Let’s say you own a bicycle shop. Consider sending an email to your customer around the time when they should be conducting their first maintenance tasks, or when they should consider purchasing new tires. Informing them on how to better care for their bike proves that your business is still looking out for them. 7. Customer support: We touched on this a little earlier, but part of knowing who your customers are is knowing how they use their products — and if they need support, knowing where they turn to in order to get it. Customer services should be an extension of your brand. If your customers look to get their questions answered via Facebook, be sure you are on that platform and actively responding. 8. Delight: There’s a difference between satisfying your customers and delighting them. Blowout salon Drybar has gone above and beyond with their customer experience. For 45 minutes, customers get to relax, be pampered and drink a cocktail or fruit-infused water as they get their hair styled. These “extras” seem small (and are cheap to offer), but they make a lasting impression on the customer. 9. Apologize: We all make mistakes, and if handled improperly you risk losing customers. If a mistake does happen, communicate with your customer, apologize sincerely and explain how you will go about preventing it from happening again. You can do this privately with the customer via email, or even publicly on your blog depending on the type of mistake. Next PostNext POLL: How Often Do You Plan For Your Business?